New Orleans, the next iPhone fighter from Samsung, Galaxy S III has finally being landed in the United States markets. The phone is currently under display in CTIA wireless show but still final decision is waiting about its start of sales in United States and how much it will cost Galaxy lovers to buy it. Samsung is displaying this new Galaxy S III in slight color variations- Pebble blue and marble white during its display show in New Orleans in current weak. With few minutes spent with this phone, reviewers were impressed by its ambition levels but not more praising about its aesthetics. Samsung’s Galaxy S III has been cleverly packed with many new features which are not in minds of many users to be, but not confirmed whether this hand on review handset was an industrial design or UI. Its screen, 4.8 inches is awfully large enough but it is not so much large like the Galaxy Note, with 5.3 inches screen. We cannot discuss for that, because that was not. However its large size is best to use when its pop up play feature in action and you have to experience a new background style. 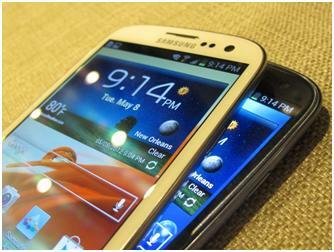 One of the new features which have been used in this new Galaxy S III, a pop-up window is displayed than can be easily dragged and you can use multi-screen browsing at the same time. When you launches a website along with few other applications and paly a video movie, all these will work with video at pop up. When you will open galaxy S III camera, a pop up will open and your attention will be diverted to opening of camera, a same feature which has been used by Microsoft for its Windows 7. The Samsung Galaxy S III will never work slow according to its processor speed and any tap and input thrown functions. Its camera has also facial recognition features which are built-in with its own application but little slick. This interface can identify any face or photo which appears in front of it. If your friends photos are bit blurred, this will automatically tag your friends in photos subsequently. If you have that person email address to whom you want to tag or share a photo, it will provide linking of Facebook, LinkedIn, or twitter profiles. Galaxy S III has voice dictation feature, S voice but it is not currently testing it in loud environment. The Samsung user interface for Android has tweaks which are specific to this galaxy version.